For every thing in life there should be a first. 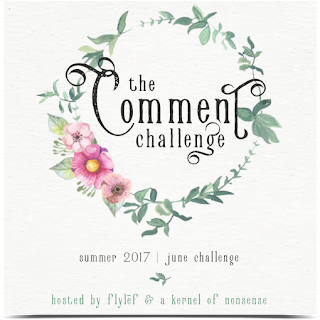 I've signed up to participate in the June Comment Challenge. This event is hosted by Lonna @ FLYLēF and Alicia @ A Kernel of Nonsense. This event is designed to help connect book bloggers by spreading some comment love. During this challenge you'll be paired up with another blogger and will comment on each others posts throughout the month. I'd love to get to know other bloggers and I'm happy to announce that I've been paired up with Alicia @ A Kernel of Nonsense. Please always feel free to comment, I always comment back. Yes, I'm so happy to be your partner this month. I already see from your My Favorite Books widget that we like many of the same books. Let's have a great month of commenting!